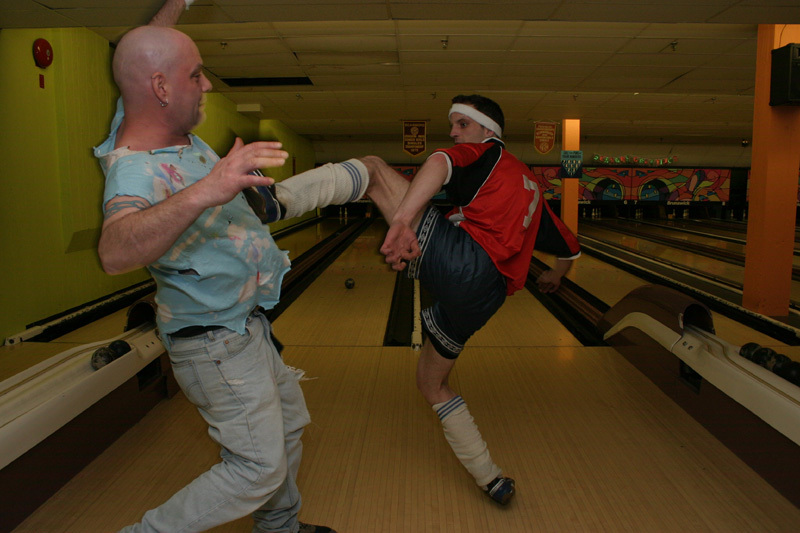 Sports biography charts the violent death of bowling, starring performers Greg Lebelle and Dragan Momchilo. Somewhere between lanes 15 and 17 a kinship was struck between the sports fan and the legendary macabre theatre of the brute. Somewhere, within those inches of space, Greg Lebelle lost the urge to fight. One explosive night out, letting off steam with World Championship Bowling owner Robert Towell at a local bar, he wandered through the thinly veiled yarn of myth and reality. The much-mythed trial was real. There was more on the line than a simple assault charge. It was Lebelle’s entire life, assumed violent, and because of his size, his muscle, his appearance, and nothing else, he was typecast as a bully. It was said that Lebelle’s statement alluded to World Championship Bowling, and within his drunken state, Greg Lebelle began to assume his character, and believed that the man with whom he was arguing was in fact his opponent, “Hollywood” Dragan Momchilo. Momchilo failed to spook him, even by biting or scratching, during their numerous battles. As a man, to deal with, he was usually helpful, easy to look up to. He emanated physical courage. He was a street fighting man who had learned how to deal with intimidation during his tough early days on the east coast and out west as a teenager. Lebelle worked as a harm reduction consultant for street health in Toronto. This, combined with the stress of continued live appearances on television, controlled fighting, and living as what he called “an artificial cog” rather than as a part of “something connected to the human concern,” propelled Lebelle to leave his bowling dynasty behind. Saturday, on one of his only days off in weeks, he is at home when Robert Towell delivers his speech at the PBA tournament, the last we’ll ever see from the famed World Championship Bowling legacy. It could be argued that Momchilo fought with his heart, Godfrey fought with spirited enthusiasm, but Lebelle fought and moved in the business with his brain. While he beat everyone into a shadow, the truest memory sports fans have of Lebelle is him taking on the local league champions during WCB’s first season. People like David Tua, James Coburg, he ripped their plaid shirts in two, got two strikes in a row, threw them into the next lane, and none of them had the power to knock him out! After his humiliation at the cleats of Momchilo’s soccer squad, Lebelle lived in fear of the sucker punch, and would take a sterile win on point-spread rather than get into a high-risk slugfest or no-disqualification contest. Whether a house show, pay-per-view or toy store appearance, Greg Lebelle was always consistent, always genuine, and always there to do the job. Dragan Momchilo has not seen the former WCB champion since their infamous cage match at WCB Damnation, though he did speak to him on the phone just before the trial. “He wished me luck, and I think it was genuine,” says Lebelle.